The TurboGrafx-16, known as PC-Engine in Japan, is a video game console first released in Japan by NEC on October 30, 1987. The system was released in late August 1989 in North America. There was no official PAL version of the system, but a grey importer provided a very limited release in the UK and continental Europe in 1990 as Turbografx (not including the “16″ in the title, and lowercase “g” in “grafx”) . The TurboGrafx-16 was an 8-bit system, with 16-bit graphics chip capable of displaying 482 colors at once. 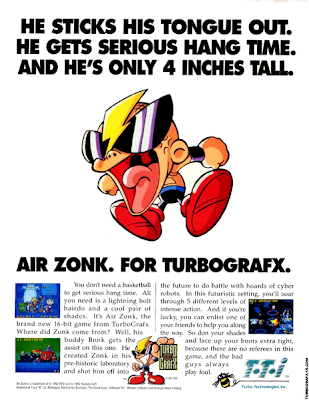 Although touted and marketed at the time as a next generation “16-bit” console, in actuality the TurboGrafx-16 had only an 8-bit CPU (16-bit referred to its video graphics chip). While sporting advanced graphics and sound capabilities above and beyond the existing 8-bit console market, it was notably underpowered compared to competing 16-bit consoles such as the Sega Genesis and especially the later Super Nintendo. Other notable feature limitations stemmed from NEC’s cost cutting measures. 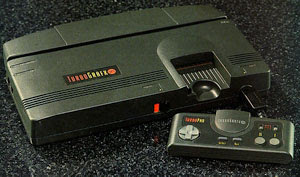 The TurboGrafx-16 lacked a second player controller port, only supported RF modulation for audio/video (the competition had built-in support for stereo audio, and for video: composite, s-video and even RGB ouput), and even lacked basics such as a reset switch or “power-on” lighted LED indicator. While after market plug-in expansion modules did exist to provide multiple player gamepad ports and composite video-out with stereo audio, they had to be purchased separately and installed externally to the system.